Congressional Cemetery was once a happening place for U.S. Senators or Congressmen to spend their eternal years. Eighty were buried there until 1870 when the sandstone centographs were deemed ugly. So the black marble stone of Stephen Joshua Solarz near the gate caught my eye. 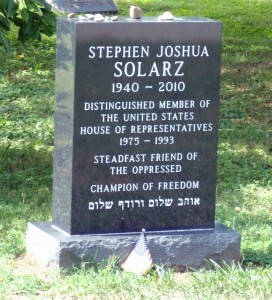 The nine-term New York Congressman was buried at Congressional in 2010 after dying of cancer. Solarz was a foreign policy expert, even once joking that he wasn’t that big in his Brooklyn district but was very well known in Mongolia. Solarz opposed President Reagan sending Marines into Lebanon in 1982 and the 1991 Gulf War. But, turned out a man who specialized in world affairs was a homebody at heart and is buried just a few miles from the Capitol. Makes you wonder. This entry was posted in Memorials and tagged Best Washington DC walking tours, Congressional Cemetery, grave, Photo by Rick Snider, Stephen Joshua Solarz. Bookmark the permalink.